Russian nuclear cooked mixture of Scotch whiskey, Irish temperament, celtic, folk and old school punk rock! 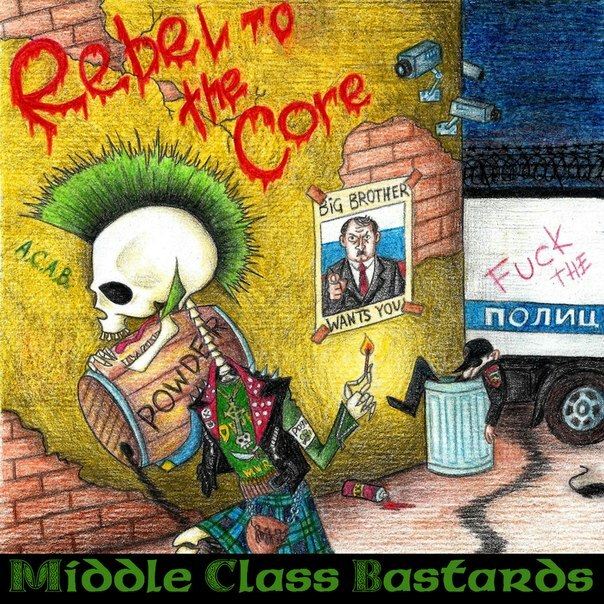 Middle Class Bastards are for certain one of the most original bands in the celtic-punk scene at the moment and it will also not suprise me one bit that you’ll have never heard of them either. Tucked away in northern Russian in a city, Arkhangelsk, that streteches for over 25 miles along the northern Dvina river in an area that is most famous for its story telling and its folklore. The internet claims thats its a ‘dead art’ but we’ve heard that too many times to start believing it. Maybe this old artform is actually as dead as the thriving celtic languages of Cornish or Manx! Middle Class Bastards were formed way back in 2006 by a group of mates who wanted to start playing good old fashioned punk rock. Many have passed through the band for them to end up where they are now. For most of the current line up the band was their first band but since then some of them have also side-projects mostly punk but Alexander and Dmitry play in a Russian traditional folk-punk band (I want to hear them as well please!) and MacGregor the bands piper also plays in a medieval metal folk band. So the band are doing their bit you could say to not only spread the celtic but also to keep alive their local traditions. Left to right: Roman – mandolin, Denis – bass, Alexander – guitar, McGregor – bagpipe, Vitaliy – drums, Dmitry – trumpet, Andrew – vocal, Kirill – naked balls! Now onto the music. Way back at the start of this review I called Middle Class Bastards “one of the most original bands in the celtic-punk scene” so heres to explain why. Recently we have covered a lot of purely folk music. Not been intended its just what I been listening to. Then I came across this and fecking hell its blows any folk cob-webs away. Most celtic-punk bands sound like any combination of The Clash,The Dubliners and The Pogues but these guys take after a much better era of punk and play what use to be called UK82 style punk rock, most famously played by Scots rockers The Exploited. The music started as a working class subculture right across the estates of Britain. Punk before this was the preserve of the public schoolboy and its pretensions were obvious to all. UK82 shook the music scene. Its not easy listening but I grew up on this stuff so I love it to bits. Middle Class Bastards take UK82 and the anger and angression and infuse it with the spirit of the celtic nations. MacGregor the piper is proud to be actually descended from a Scottish regiment’s warrior who arrived in Arkhangelsk in the years of the Russian Civil War 1918-1920. I guess that makes them a celtic celtic-punk band dont you think? Anyroad 0n with the music and the five track EP starts with ‘Putin In The Charts Again’ and the classic UK82 guitar sound kicks it off but then the mandolin and pipes join and when Andrew starts his tirade against Putin you’re certainly in celtic-punk territory but not sure how many of you will be able to hack it here with me! The Rancid style vocals fit perfectly and even though they sing in English its delivered immaculately and its easily understood despite the speed they’re playing at. A trumpet only adds to the enjoyment and ‘Rebel To The Core’ that follows is a bit more of a traditional punk rock song sounding a bit more American than the rest of the EP. Starting with a snippet from One Flew Over The Cuckoos Nest the mandolin dominates the sound though and i have to say that the EP is mixed perfectly with all the instruments as clear as a bell. ‘Cop Land’ is yer classic anti-cop song and as we know the Russian police take no prisoners so we can’t blame the boys for taking this opportunity to get one back on them. The EP’s standout track it really showcases all the strands of the band coming together perfectly from the great vocals and catchy lyrics to superb mando and piping and the trumpet adding that extra bit of originality too but the rest of the band contribute greatly. The other great enemy in Russia is swiftly up next and ‘Politicunts (Deserve The Boot)’ is yet another beauty with McGregor’s piping out front while Andrew puts the boot in! ‘Boston Hospitality’ is more of the same and is an ode to Boston and its Irish roots. Catchy as hell and a great singalong chorus bring this fecking brilliant EP to a close. There are a few other notable bands in Russia flying the celtic-punk flag, most famous are Zuname and Drunken Fairytales from Moscow and The Pauki and Garlic Kings from St.Petersburg. Middle Class Bastards live too far away to have played with them so having grown up on their own they have developed sound all of their own so unusually for me in one of my reviews I haven’t been able to compare them to anyone. Its great fun and boy I bet their something else to catch live. This band deserves your support so help them out any way you can. You can start by downloading for free this EP. Link is at the bottom of the page. 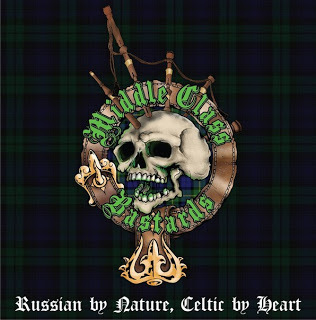 I just got their debut album from last year with the great title ‘Russian By Nature, Celtic By Heart’ and after a couple of plays its already grown on me! A superb band that maybe wont appeal to any one of a folk nature but take a chance on them anyway and why not. 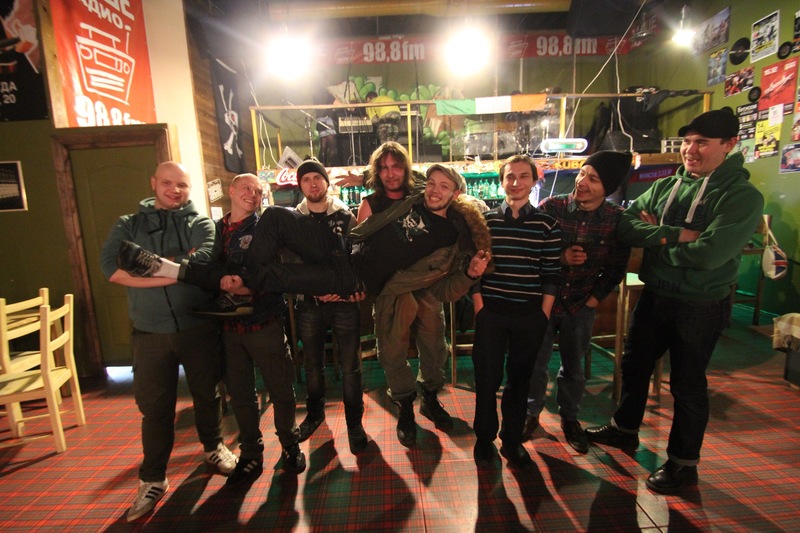 Celtic-punk is all about taking those traditional tunes and instruments and attitudes and taking them to new places and these bhoys from the cold north of Russia have certainly done that.